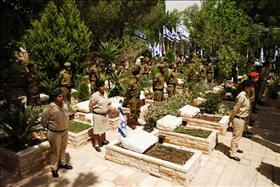 Following Hiddush's demands: the IDF regulations regarding the burial of fallen soldiers have been changed. It is now possible to hold a military funeral without religious contents in a military cemetery and - secular military funerals in civil cemeteries. Following Hiddush's petition to the military and government authorities, the IDF issued an update to General Staff Order ["38.0116 - Military ceremonies for funerals or dedicating tombstones"], permitting the families of fallen soldiers to hold funerals without religious content for their loved ones. Up until this amendment, fallen IDF soldiers could only be buried in religious funeral ceremonies (Orthodox funerals for Jewish soldiers, or according to the religions of the fallen soldiers). Families who wanted to bury their loved ones in civil ceremonies were required to do so in civilian cemeteries without any military honors (such as carrying the coffin, ceremonial wreaths, honor guards, and official eulogies). The new rule states for the first time that "In the process of arranging the funeral, the deceased soldiers' loved ones are permitted to choose whether they wish to maintain the religious characteristics of the funeral ceremony" (religious content includes the reading of biblical verses, the recitation of psalms & prayers by a military rabbi and cantor, and the recitation of the Kaddish prayer by the family). However, the amended regulation still shows a lack of understanding and a disrespect for secular alternatives to Orthodox burial, as dictated by the military Rabbinate, and the alternative of non-Orthodox religious funerals, such as Reform and Conservative. Unfortunately, the military has only gone halfway, without permitting proper alternatives for secular or religious non-Orthodox funeral ceremonies. This reflects disrespect for both secular and non-Orthodox religious funeral rituals. Hiddush welcomes the important step taken by the IDF authorities in response to our demands and the progress towards religious freedom in the military. The new order constitutes a real revolution regarding a very sensitive matter, which has been under the control of the Orthodox military rabbinate for decades, without any justification. As we claimed to the IDF and the Ministry of Defense, in the Jewish and democratic state of Israel, there is no reason that religious freedom should end at the gates of military camps and cemeteries. Unfortunately, the military has only gone halfway, without permitting proper alternatives for secular or religious non-Orthodox funeral ceremonies. This reflects disrespect for both secular and non-Orthodox religious funeral rituals by prescribing a bare-bone ceremony (once you remove the religious content) and treating any additional poetic, literary, or philosophical readings that are common components of secular burials as 'exceptions' that require 'pre-approval by a senior ranking IDF officer;' and when it comes to any deviation from the prescribed Orthodox religious ritual, the pre-approval of the Orthodox military Rabbinate is required. Hiddush will not accept this, and will insist on hearing our petition before the High Court, as we reject the IDF's contention that this new order offers a 'full response' to our demands. Hiddush has been working for a number of years to achieve equality of burial rights among IDF soldiers in order to eliminate any exclusion of or discrimination against soldiers whose mothers are considered "not Jewish" by the Israeli Rabbinate, or soldiers whose families prefer to hold secular or non-Orthodox religious ceremonies. At the end of 2015, following Hiddush's appeals, the Attorney General informed Hiddush that he had instructed the IDF to include explicit orders to allow families to hold military funerals without religious content, without forgoing the right to military funerals. More than a year later, this had yet to be implemented, and Hiddush petitioned the High Court of Justice to compel the military authorities to act on the Attorney General's directive without further delay. With the deadline on which the IDF was required to respond to Hiddush's petition being today, the military authorities finally completed the task assigned to them on Thursday and informed us of the new order on Thursday. According to the amended General Staff Order, the family of the fallen soldier can choose the nature of the military burial ceremony, and IDF soldiers can be buried in military cemeteries with full military honors without religious content. For the first time, the fundamental principle of freedom of religion and conscience has been explicitly extended to the realm of military ceremonies that until now have been under the total control of the military Rabbinate, which dictated the character of these ceremonies according to its Orthodox religious worldview. Still, this is not yet the end of the battle: in its petition to the High Court of Justice, Hiddush demanded that non-Orthodox religious funeral ceremonies also be permitted to fallen IDF soldiers. This matter was not resolved in the new order, and Hiddush will therefore continue its petition regarding the regulation of military burial. Another issue related to military burial in Israel is the burial of fallen soldiers whose mothers are not considered Jewish by the Israeli Rabbinate, including tens of thousands of immigrants from the former Soviet Union. Hiddush's 2015 letter of demand asked that these fallen soldiers who are officially registered by the State of Israel as "having no religion" be buried alongside their comrades who fell with them in combat, rather than separately. The Defense Ministry responded to the demands of Hiddush and other groups, publishing a new binding order whereby soldiers with non-Jewish mothers would be buried alongside Jewish soldiers. It adopted a compromise approved by the military Rabbinate to bury these soldiers four cubits away from the closest grave. This change has already been actualized in 2017.